It appears nothing can stop the FIBA Europe EuroCup Women basketball competition. Despite the freezing temperatures all the visiting teams arrived at their destination. Based on the seeding for this competition all the visiting teams start as favourites despite the number of roster changes. Out of the 16 games, 5 were won by the home teams and one game finished all square. Botus Spor from Turkey take a 14-point lead into the second leg against Polish club side CCC Polkowice. Epiphanny Prince, (left) who was in all the basketball news earlier in the season because she forfeited her final year of NCAA eligibility to play professional basketball, was the star of the match. 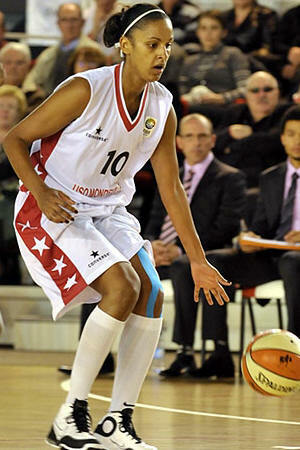 She led the scoring with 20 points for Botus Spor in their victory (74-50). Chamique Holdsclaw joined K. V. Imperial AEL recently and was one of the stars of the match with 17 points in their home victory against Dunav Econt Ruse (93-65). In the remaining home victories Polish side Energa Torun held off Dynamo Kyiv (64-61) and BC Dnipro beat (59-57) Ibiza Sport Island. Jolly JBS Sibenik cruised past Gran Canaria (62-40). 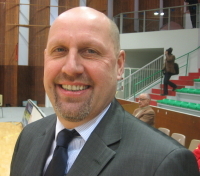 Mondeville travelled to Romania and beat Baschet ICIM (84-68). Lenae Williams (right) connected 6 times from 15 attempts from behind the arc and finished with a game high 28 points. Tameka Johnson who scored the first points of the match finished with 13 points and 5 steals. This was a win that satisfied Hervé Coudray who explained after the game that they came to Romania for the victory. It was not easy playing against a team that play well together and in the end they made the break by tiring out their opponents. Lattes Montpellier had a difficult trip to Russia but came away with the victory (67-61) against Spartak Noginsk. Pauline Krawczyk led Montpellier with 19 points. But it was the combination of Mandisa Stevenson (14 points) and Constance Jinks (12 points) that allowed Montpellier to hold the advantage going into the final quarter. 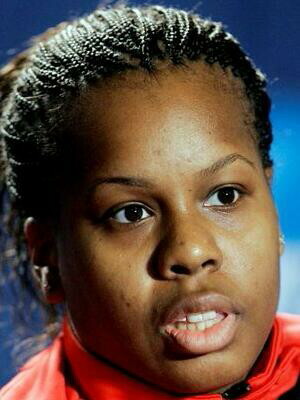 Tina Thompson and Linda Fröhlich made their EuroCup début with Municipal Targoviste by beating MBK Ruzomberok (90-68). Thompson scored 13 points and picked up 14 rebounds while Fröhlich contributed 15 points. However it was Israeli international Shay Doron who stole the show with 29 points for the winners. Erik Lehmann (left) is back in coaching after his exit from Aix-en-Provence at the end of last season. He took over the reigns of Swiss club Sdent Sierra. Sdent Sierra hosted Dynamo Moscow and fell by a single point (61-62). Dexia W Namur had no answer for Romy Bär, Petra Manakova and Tyresa Smith from Saarlouis Royals and lost (71-95). Bär led the team from Germany with 25 points. Mann Filter won on the road against Romanian club side LMK SBC SF. Gheorghe (85-57) in the first leg. Spanish international Lucila Pascua with a double-double of 12 points and 13 rebounds was the player of the match. In the other game played on Wednesday Zeljeznicar NLB finished on level terms with KK Hemofarm Stada (69-69).